LeMetric Hair & Beauty Studio and Oasis Dance Co. are participating in NYC’s Gay Pride 2013 parade to fight for marriage equality through dance. Dating back to 1970, Gay Pride started on Christopher Street after its underground meet up spot, Stonewall, was raided the year before also known as the Stonewall Raids. This year LeMetric with the help of their head hair stylist, Egypt Buck, will be a part of this huge march starting on 36th St. & 5th avenue and ending on Christopher Street where it all began. LeMetric and Oasis Dance Co. are marching for equality through dance, music, and beauty. 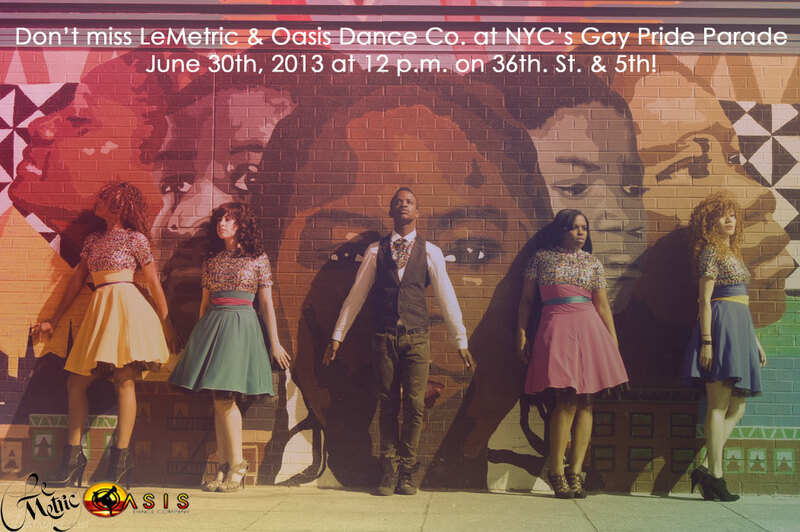 Six performers from Oasis Dance Co. will join LeMetric and Egypt’s six performers here in Manhattan on June 30th to push for gay marriage equality. These performers have kept in touch and practiced via mobile videos and through a Facebook group page. The group also scheduled to meet on Sunday, June 30th to finalize all choreography. Performing popular songs by Beyoncé, Ciara, Shangela Laquifa, Wish, and Iggy Azaelia this group of performers promise to bring some great energy to the crowd at Gay Pride. To LeMetric, hair is an art, a form of expression and hopes this is a medium between LeMetric and the Gay Community. LeMetric understands how important it is to express yourself and wants to work with the most creative and expressive individuals within the gay community. LeMetric Hair & Beauty Studio offers hair extensions, hair pieces, etc. for everyone. Teaming up with Egypt and Oasis Dance Co. was a no brainer as they are heavily involved in the Gay Rights movement both in the DC area and Manhattan. LeMetric Hair & Beauty Studio will be decorating its Mobile Beauty Studio as a post-wedding vehicle with cans attached and all. Volunteers will march with the Mobile Beauty Studio dressed as couples and handing out stickers to attendees. LeMetric’s Mobile Beauty Studio serves as a wedding vehicle for brides and their bridesmaids who need to get ready for the big day on-the-go. The Mobile Beauty Studio also caters corporate events such as employee appreciation days, and teams up with other businesses to bring beauty to their clients. Yoga in the rain on the steps!